Framed 3D bronze wall art mounted in a quality frame, entitled ‘Salmon of Knowledge‘ and signed by the artist, A. Rynart. 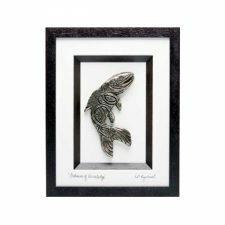 A Celtic style Salmon made of bronze, depicting the story of the ‘Salmon of Knowledge‘. 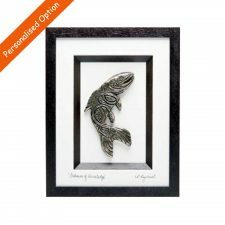 The salmon of knowledge bronze art is a beautiful piece of Irish Wall Art, handmade by Rynhart Bronze Fine Art, in Glengarriff, West Cork, Ireland. 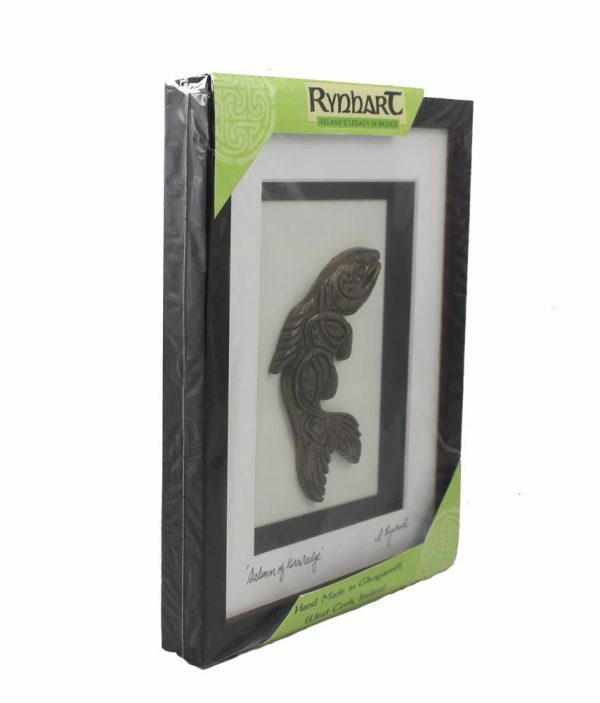 Quality Irish gifts by Rynhart, award winning design. 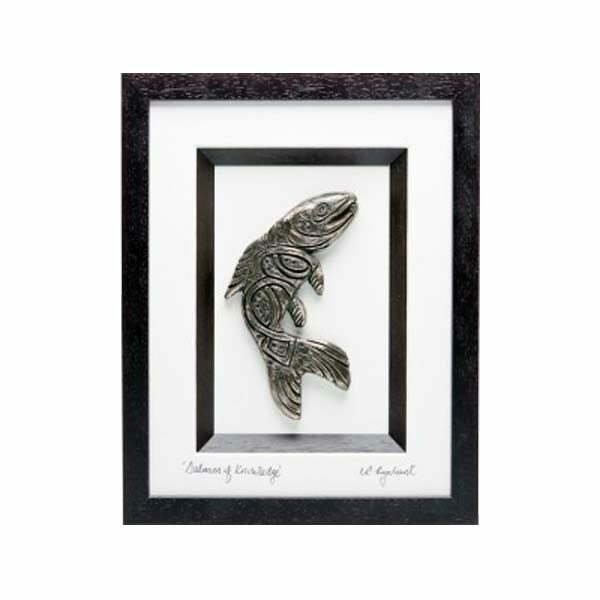 Framed bronze wall art entitled ‘Salmon of Knowledge‘. 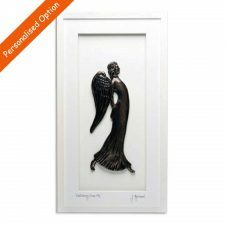 Beautiful handcrafted bronze 3D art, mounted in a quality frame. 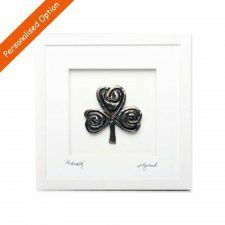 This Irish Gift has a choice of white or brown frame. 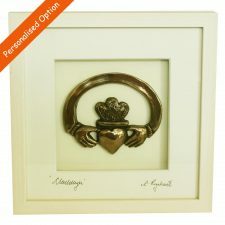 Dimensions: 7.5cm x 9.5 cm x 1cm. 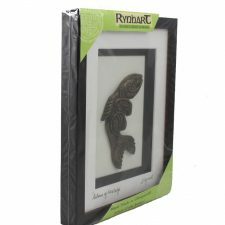 This gift is suitable for lots of different special occasions, but it is perfect for graduation gifts for men and women, signifying the knowledge gained from the accomplishment of graduating from school or college. 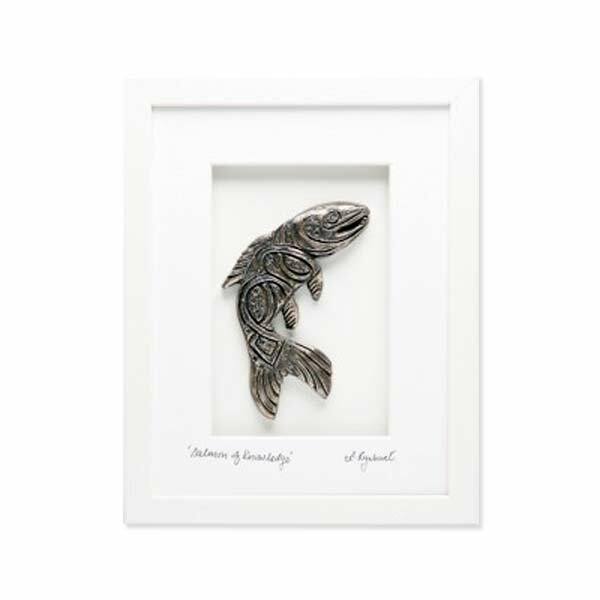 Representing the famous legend of the Salmon of Knowledge, this is a truly unique Irish graduation gift and handmade in Ireland. The ‘Salmon of Knowledge‘ is a well-known Irish legend about Fionn Mac Cumhaill. Irish Legend has it that the first person to taste this famous Salmon would gain the wisdom and knowledge of the world. Finnegas, Fionn’s mentor, caught the salmon and was very excited that he would be the first to taste the fish and gain the knowledge of the world. He left Fionn to finish cooking the Salmon, when a cooking blister appeared on the Salmon’s skin, Fionn burst it with his thumb and in doing so burnt his thumb, without thinking Fionn sucked his thumb to stopped the pain, in essence this meant that Fionn was the first to taste the ‘Salmon of Knowledge‘ and he therefore become the wisest man in the world. 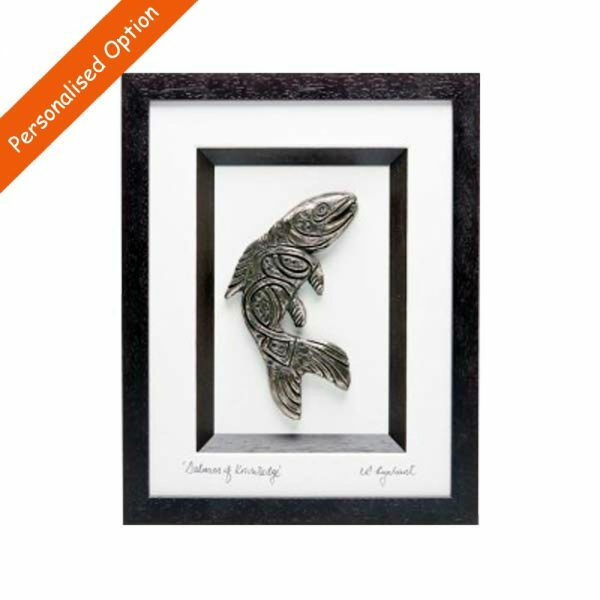 I always loved the story of the Salmon of Knowledge and I saw this and bought it for my son on his graduation! It looks great hanging in our home. 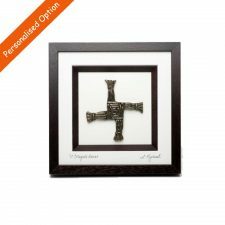 Thank you for your help with personalising this. Will recommend. Thanks very much they arrived promptly and look great, and the wrapping paper is lovely too!